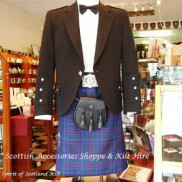 The Kilt Pin became fashionable in the 1800s and has continued to this day, universally worn on kilts or kilted skirts. Thistles feature prominently in many as does the Claidhmhor (pronounced 'Claymore' meaning big sword). The Highlanders sword were often of incredibly large proportions requiring the use of both hands. 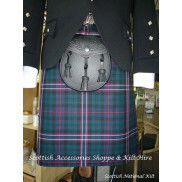 We have Kilt pins for every occasion, clan crests, contemporary and traditional designs. The Argyll Interlace Kilt pin features the continuous interlacing that to the Celts signified the ev.. The Argyll Interlace Kilt pin features a stone as well as the continuous interlacing that to the Cel.. 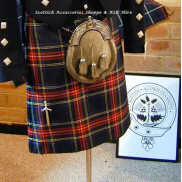 The Bagpipe kilt pin the perfect gift for any piper! Made in Scotland from the finest pewter and .. This Bruce kilt pin is the perfect gift! Measures 4cm x 10cm. Made in Scotland from the fin.. This Bruce kilt pin is the perfect gift! Measures 4cm x 10cm. This kilt pin is antiqued finish.. The Claidhmhor kilt pin the perfect gift! Made in Scotland from the finest pewter and Palladium p.. This Claidhmhor/sword kilt pin is the perfect gift! Made in Scotland from the finest pewter.. The Claidhmhor kilt pin the perfect gift! This pin is the antiqued version. Made in Scotland from.. This Claidhmhor pin features Celtic knotwork at the hilt and the Lion Rampant, measuring 4cm x 9.5cm.. This Claidhmhor pin features Celtic knotwork at the hilt and the Lion Rampant & antique finish, .. The Claidhmhor kilt pin with Thistle the perfect gift! Made in Scotland from old fashioned Pewter.. The Claidhmhor kilt pin with Thistle the perfect gift! Antiqued version. Made in Scotland from ol.. The Clan Crest Kilt Pin is manufactured in Scotland by Art Pewter offering the largest ran.. This kilt pin is perfect for children as it is small and durable. 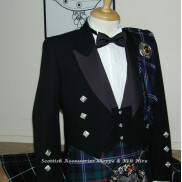 Made in Scotland from old fashi..